This is the messy part, and a very good reason why the first fix is separated from the second fix stages of the renovation process. 1 Tack all the stud walls with plasterboard and repair any damage and / or holes. Cover anything you don’t want plaster and paint to get on like staircases and windows. 2 All walls and ceilings will be plastered at this stage, leaving wires exposed for the return of the electrician. 3 Floor screeds could be laid after the plastering to make sure the flat even ground doesn’t have any unwelcome bumps, especially if under-floor heating is being laid - where the pipe-work will be laid after plastering but before screeding. However, if a clean join is required and no skirting it is often the practice to reverse the process. 4 Ordinarily, and especially if moisture absorbing timber products and flooring are to be included within your project’s beautification process, four to six weeks will be the sort of time a house will need to dry out. However, dry-lining instead of hard plaster and suspended timber floors instead of concrete, not to mention the moisture absorbent emulsions that developers often use, will help circumvent some delays. 5 Once the property is suitably dry and prior to the second fix carpentry, this would be the time to install the hard floors. This includes wooden floors and the kitchen floor and bathroom floor and wall tiling. Not all rooms have to be four straight walls. You can add alcoves, recessed drywall shelving, curves and shapes. 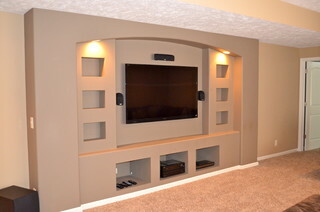 As you will see from the American example above, a feature media wall can be created as part of the wall building process. Expensive units can be replaced by incorporated features. Light fittings can be installed above alcoves and wine racks can be included into recessed walls.